We’ve scoured the wilds to find the best tough cameras for your back country (and front country) adventures. Cameras that function no matter what the extremes of weather and environment are. Cameras that can suffer any abuse your heart desires and still bring home the pictures. We paired our own decades of professional outdoor photography experience with an analysis of almost a dozen comparative camera reviews to find the best rugged camera for you. So what exactly are Tough Cameras? Let’s start with what Tough Cameras are not. Your cellphone is not a Tough Camera. As cell phones have evolved so too has the quality of images produced with them. Many new cell phones like the Google Pixel 3, Samsung Galaxy S9 or iPhone XR are weather and waterproof—to a point. If you shoot in the rain, drop your phone into a creek or take a dunking while rafting, you’re covered. But I wouldn’t test a cell phone’s durability much further than that. Don’t bounce your phone off a boulder, take it into a sandstorm, let it freeze or overheat or shoot with it at any depth underwater. Even in a protective case, a cell phone is still a cell phone with shortcomings in the camera department: a fixed focal length lens with limited telephoto capability (most will do a digital zoom which produces lower quality images) and limited exposure control (see our Guide to Best iPhones for Outdoor Adventures to learn more about what phone cameras can and can’t do these days). Tough Cameras are not “action” cameras like the GoPro Hero 7. While action cameras are fully water and weatherproof, they only have one wide angle focal length and a point of view that usually comes from being mounted on a helmet or other object. There is no exposure control. GoPros can take stills from the video but these kind of cameras are primarily dedicated to video. Tough Cameras are sophisticated auto focus, auto exposure, point and shoot cameras with video capability. Although Tough Cameras are video capable, and can shoot high quality video, they are not primarily video cameras. Tough Cameras are tough! Weatherproof, waterproof and crushproof, they can survive being dropped onto rocks, buried in mud, tossed at grizzly bears and stomped on by moose. Tough Cameras can function in rain, snow and sandstorms and withstand extremes of hot and cold temperatures. Tough Cameras have quality optics. Good lenses that are sharp edge to edge with accurate color reproduction are the cornerstone of good photography. Unlike many phone cameras, Tough Cameras have optical telephoto lenses not digital zooms. The digital zoom found in most phones is merely a low quality crop of the image in your viewfinder. An optical zoom found on Tough Cameras actually pulls the subject closer in the viewfinder. The cameras reviewed here will zoom (optically) from about 24mm to 100mm. Most Tough Cameras have macro and even micro lens settings for extreme close-ups. A photo taken on the Continental Divide Trail with the Olympus TG-5. Photo by Dean Krakel. Tough Cameras can handle a wide latitude of varying exposure situations with automatic (and semi auto) settings. For instance, under the “Scene” mode the Olympus TG-5 has 5 basic semi-automatic exposure settings: People, Nightscapes, Motion, Scenery and Indoors and over 20 different adjustments under those sub categories to further fine tune exposure. Exposure, back in the long ago days of film meant the amount of light that touched the film inside the camera and produced the image. These days the camera’s sensor does the same thing. Tough Cameras can shoot single still images or bursts with zero or miniscule shutter lag. Most have autofocus adjustments that can hone in on a single object or keep a moving subject in focus. In contrast to phones or full size DSLR cameras or other non-tough point-and-shoots, tough Cameras don’t need protective cases and are small enough to fit in a shirt pocket or backpack pouch. They are ergonomically designed for ease of use and large enough for their controls, buttons and settings to be used even with glove liners on. A tough camera’s weight is measured in ounces. The weight of a typical DSLR camera, the kind with interchangeable lenses that you wear around your neck and hold in two hands is measured in pounds. The Olympus TG-5 is a pleasure to use in any weather. Photo by Dean Krakel. I used the Olympus TG-4 on my Colorado Trail thru-hike in 2015 and became a huge fan. The stills I took documenting The Colorado Trail that appeared in the award winning Long Haul video were all taken with the Olympus. As soon as the TG-5 was available, I bought one to use on my Continental Divide Trail journeys as well as everyday outdoor adventures. I can’t say enough good about this camera. Small and light with great optics, lightening quick auto focus and easy to master controls, the TG-5 has ridden in my shirt and shell pockets from sub-zero snowstorms to blazing hot deserts and never let me down. A wild fire burning near the Wind River Range, Wyoming taken on the Olympus TG-5. Photo by Dean Krakel. The TG-5 also has a GPS sensor for tracking your journeys, a thermometer, barometer and compass. Gathered data can be displayed by using the Olympus Image Track app. A great example of the focal length of the Olympus TG-5. Photo by Dean Krakel. With only 12 megapixels, the TG-5 falls short in the megapixel department compared to other Tough Cameras reviewed. “What's interesting about the Olympus' Tough TG-5 in terms of its sensor is that its 12-MP sensor has a lower megapixel count than its predecessor, (TG-4 had 16MP) yet still provides very good quality,” said Tom’s Guide. In my professional experience however, megapixels alone don’t determine image quality-a camera’s optics and the size of its processing sensor does that. The TG-5 uses the same full size sensor and TruePic VIII processor found in the Olympus E-M1 Mark II--a camera that is almost three times the TG-5’s price and weight and sports the same quality optics Olympus uses in their professional line, a bright f/2.0 25mm lens at wide angle and an equally bright f/4.9 fully extended to 100mm. The Olympus TG-5 performs well in low-light environments. Photo: Dean Krakel. The TG-5 shoots 4K video at 30p or high-speed footage at 120p in Full HD. “It shoots video at the highest available resolution (4K) and image quality is best on test both for stills and moving pictures,” said The Independent IndyBest. With the TG-5’s wifi capability and the Olympus Image Share app on your smartphone you can swiftly transfer images from the camera to your smartphone. You can also use Image Share to shoot your camera remotely (for group shots that you want to be in). Independent IndyBest says, “The design lets enthusiasts attach converters and accessories to the lens for greater versatility. There are plenty of features for extra control, such as macro settings that let you get as close as 1 cm in Microscope mode, and a Pro capture setting, which starts shooting before you press the shutter so you don’t miss that dolphin diving.” With the Olympus TG-5 you can also buy a 2x teleconverter to double the camera’s focal length. There’s also an ultra wide fisheye lens attachment that screws onto the front element giving the TG-5 increased versatility. Last year I bought the 2x teleconverter that screws onto the front of the TG-5 making the 100mm lens a 200mm and found myself using that more than I thought I would. With the Olympus TG-5 you can use Image Share to shoot your camera remotely (for group shots that you want to be in). Photo by Dean Krakel. As with other reviewers, we had a tough time parsing out the pro’s and con’s of the Olympus vs. the Nikon. But in our book, the Olympus comes out ahead. The TG-5 has more menu settings and options. The battery life is longer, 340 shots vs. 280 shots on the Nikon. The minimum focus distance on the Olympus is 3.9 inches vs. the Nikon’s 19.3 inches. This is despite the Nikon having a slightly higher (5x vs. 4x) digital zoom than the Olympus. What this means is you can focus more easily on close up details with the Olympus. The Olympus has a continuous shooting speed of 20 frames per second vs. the Nikon’s 7, making it easier to shoot multiple frames to capture peak action or a fast action sequence. A landscape shot taken with our top pick, the Olympus TG-5. Photo by Dean Krakel. The Olympus has more flexibility in file extensions you can save photos and video. Olympus can save photos in raw and jpeg and movies in three file extensions not available in the Nikon: mov and mjpeg, avi. In addition to letting you choose exposure based on Auto Mode or Program Mode, the Olympus has an Aperture-Priority mode. This works as a hybrid between Manual and Program. The camera chooses shutter speed, you choose the aperture (f-value). The Olympus has up to a 30-second self timer delay. The Coolpix only has 10 seconds. It can be done with remote control and via remote live view, which allows more time to fiddle when setting up a shot. The Olympus has a built-in speaker, which the Coolpix does not have. This is beneficial if you’re trying to record and listen to video’s audio on the go, although you can also get audio by pairing a camera to a phone. An example of the landscape capabilities of the Olympus TG-5. Photo by Dean Krakel. We know that photographers are loyal to their camera manufacturers and we think that either camera is an excellent choice for a tough camera. You can’t go wrong with either choice. But if you haven’t yet developed a loyalty to a specific camera-maker, we think the Olympus may serve you better over the long haul. After 3 seasons of use, I still haven’t fully explored the TG-5’s capability or maxed out its toughness. I love the Olympus TG-5 for it’s bright f/2 wide angle 25mm lens. I tend to see the world in wide angle. This is my go everywhere everyday carrying around camera. It’s my go-to backpacking, skiing and running camera. I find the controls easy to use and in most of the camera’s automatic settings, the exposure is dead on. It’s small and unobtrusive and carries lightly and easily in a pocket within easy reach. Best of all, the TG-5 has proven Dean proof. The Nikon CoolPix performing in less-than-ideal conditions. This photo and others in this story were taken with an earlier model of the Coolpix W300, the AW100. Photo by Naomi Hudetz. The Nikon Coolpix was put through the ringer in the Canadian Rockies.. Photo by Mike Unger. The CoolPix uses Nikon’s sophisticated new SnapBridge technology with Wi-Fi and Bluetooth capability to provide wireless links between the camera and your smartphone. SnapBridge allows you to transmit photos to your phone as you shoot. And, as with the Olympus, you can use this Wi-Fi and Bluetooth to control the camera remotely. The Nikon Coolpix never failed to perform in rain, snow, cold, or heat. Photo by Naomi Hudetz. The “buttons aren’t much bigger than on regular cameras but are still functional and feel good to use,” said the Independent IndyBest. “Battery life is claimed at 280 shots, less than some here, but still a decent stretch, towards a full day of average use.” Indeed, compared to the 340 shots on the Olympus, we found battery life to be among the few drawbacks of the Coolpix. The Panasonic Lumix is so tough that it survived five days in the muck of the Gila River, New Mexico (shown in this photo) before it was found and returned to its owner. The camera that was lost is the one that took this photo and is still operating well several years and many adventures later. This photo and others in this story were taken on an earlier model of the TS7, the TS5. Photo courtesy Whitney LaRuffa. In bright conditions like found in the Sierra (shown) or Rockies in the summer or the desert, an electronic viewfinder can be beneficial to prevent glare. Photo by Whitney LaRuffa. But reviewers write that the wide-angle zoom was less of a wide angle than many outdoor photographers want. “The TS7's lens is only 28mm at the wide-angle end of the zoom (as opposed to 24mm or 25mm). As a result, my landscapes of underwater seascapes weren't quite as expansive, and I wasn't able to include as many people in a group portrait (unless I stepped back a little),” said Tom’s Guide. The Lumix in low light conditions on the Oregon Desert Trail in the autumn. Photo courtesy Whitney LaRuffa. Wildlife photos can be difficult to capture with any point-and-shoot camera. This photo of a marmot in the Sierra near Bishop Pass was taken with a Panasonic Lumix. Photo by Whitney LaRuffa. In addition the Panasonic’s auto focus can track a moving subject at 5 frames per second. The Panasonic Lumix TS7 is the most waterproof camera we reviewed and can go deeper by a few feet than the other tough cameras. Panorama taken in the Sierra with the Panasonic Lumix. Photo by Whitney LaRuffa. The Panasonic is the heaviest Tough Camera we reviewed, coming in at a hefty 11 ounces. The battery life is relatively short among tough cameras--250 shots per battery isn’t outstanding, but it’s probably enough for a day’s outing. If magazine-quality images and weight are not as important to you as ease of use and extreme durability and waterproofness, the TS7 is an excellent choice. If Olympus TG-5 and Nikon Coolpix W300 tough cameras are beyond your budget you should consider the Fujifilm FinePix XP130. 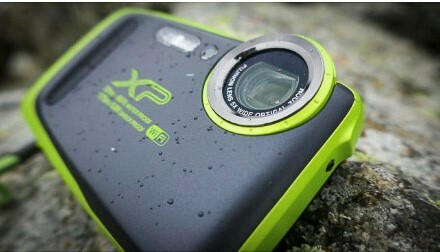 Waterproof down to 65 feet, the FinePix can be dropped from 6 feet and function in temperatures from 14 to 104 degrees Fahrenheit. The FinePix has 16 megapixels and a zoom lens that goes from 28-140mm. The camera can also shoot 1080p video, and has a Cinemagraph Mode that lets you take still images as you video. “Video recording is at Full HD, at up to 60fps, which is faster than many, but lacks the 4K-resolution video of some cameras here,” said the Independent IndyBest. Like the other tough cameras we considered, the FinePix has Bluetooth capability, allowing you to transfer your photos to a smartphone or tablet. The FinePix also has an electronic level so you can get the horizon level in your photographs. Battery life at 240 shots isn’t as much as some of the other cameras reviewed here but when a camera does just about everything else a Tough Camera is supposed to do at half the cost of other models, what’s to quibble about? My first tough camera was a Ricoh. Having destroyed some larger, more expensive cameras during my backpacking trips I found the Ricoh a welcome, weatherproof, relief, tough, inexpensive and easy to keep a grip on in dicey situations. But, I found the small screen on the Ricoh hard to see and the controls awkward to use. That said, if you intend for your images to be posted on social media or websites, and not reproduced in magazines or hung on gallery walls, the Ricoh’s image quality should be fine. The Ricoh’s strength (aside from being virtually indestructible) is the 6 LEDs that surround the lens. The LEDs can be used to light up macro images or for more flattering portrait light then a direct flash. The lights also come in handy for shooting underwater. Being adventurers ourselves we researched reviews on Tough Cameras in TechRadar, B&H Photo, Tom’s Guide, CameraLabs, Independent IndyBest Reviews, Digital Camera World, DPReview, and ePHOTOzine, then aggregated and analyzed them for criteria important to outdoors people--features like waterproofness, battery life, ruggedness in a range of scenarios and the quality of images produced. I’ve spent four decades working as a photographer, photojournalist and photo editor in the Rocky Mountain West with work appearing in various publications including National Geographic, Outside, Life and Rolling Stone magazines. I know what savage conditions a camera has to go through sometimes for the sake of a few pictures. I know what makes a camera tough. An avid hiker, skier, trail runner, rafter, mountain biker and kayaker based in Crested Butte, Colorado I am notoriously hard on camera gear. Fellow staff members at the Rocky Mountain News once presented me with an award consisting of a rusty camera sealed inside a water jug. Assignments and photo adventures have taken me to nearly every hardscrabble place in the West and beyond. I’ve caught Dengue fever in the headwaters of the Amazon and suffered a touch of cerebral edema on Kilimanjaro, looked for lost tribes in Ethiopia’s remote Omo Valley, and rowed the Colorado River in the Grand Canyon twice. In 2015 I left my newspaper career to hike the 500 mile long Colorado Trail; a film about that hike-The Long Haul-won a Heartland Emmy Award. All of the still images in The Long Haul were taken with a Tough Camera, an Olympus TG-4. My latest project is hiking and photographing the 3,100 mile-long Continental Divide Trail and to date most of that has been photographed with a TG-5. More of a table and chart person? Compare the models by Toughness / Weight / Battery Life or Optics / RAW / GPS / Monitor in our Comparison Table of Tough Cameras section. The most important feature of a Tough Camera is its ability to function in wet conditions, be it monsoon, blizzard or a plunge into lake or ocean. There is nothing worse than having a camera cease to function because it gets wet. Being waterproof is a matter of withstanding water pressure, which increases incrementally with depth. All the cameras considered here are fully sealed against moisture and rated to work at a minimum of 45 feet underwater with two rated at twice that depth. I value the waterproof qualities of Tough Cameras almost above all else since I’ve had 4 non-tough cameras (along with their lenses) die watery deaths through various boating mishaps. If you intend to take your camera skiing, backpacking, mountaineering, snowmobiling, or ice fishing, chances are temperatures will get low. At temperatures below freezing, the housing of non-rugged cameras can become brittle and possibly crack or break, lenses can malfunction-especially the zoom. Temperature extremes, for instance taking your camera outside into the cold or vice versa, can cause condensation to penetrate the camera body and lenses; lenses may fog to the point of being unusable. LCD viewing screens on non-weatherproof cameras may grey out or lose contrast in cold temperatures. All the cameras that made our list can handle the cold down to at least 14 degrees F.
With a tough camera, you aren’t afraid to capture the most difficult moments of an adventure, which often are the times that make the best photos. This photo was taken during a blizzard in the Canadian Rockies on an Olympus TG-5. Photo by Liz Thomas. While spending time in the wild the odds are good that you’re going to drop your camera or bump it off of someplace you’ve set it. A typical point-and-shoot camera can break and cease to function after a hard fall. If you drop your phone and don’t have it in a protective case you stand to lose a lot more than just the ability to take photographs. All tough cameras are meant to withstand unfortunate accidental blows. In the San Juan mountains of Colorado I once knocked my very expensive non Tough Camera off a small cliff and watched helplessly as it tumbled to the bottom. A Tough Camera would have survived that. Should a heavy footed friend step on your Tough Camera, run over it with a mountain bike or stomp on it with skis it’s nice to know that it won’t burst into pieces. At the extreme end a Tough Camera can probably survive being driven over (at least in the dirt), smashed under a boulder, tossed under a snow machine or stepped upon by an angry elephant. While I can’t personally vouch for a Tough Cameras toughness in those last scenarios I’m fairly confident, given my experience with TC’s, that I could pick it up and keep on shooting. Once I had a packhorse fall on a steep trail and roll downhill several times; that particular horse was carrying most of my non-tough camera gear as part of its load. The horse was fine. An expensive Nikon was crushed to pieces. A Tough Camera would have survived. 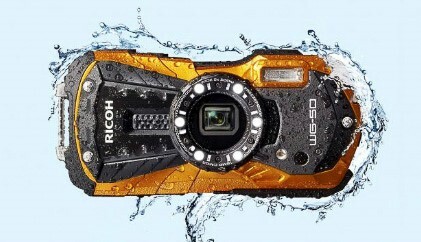 Photo of a person taking a photo with the Ricoh Tough camera. Photo was taken with the Panasonic Lumix Tough camera. Photo by Whitney LaRuffa. Dust is subtle and destructive. The same things that make a Tough Camera waterproof-a tightly sealed body and a protective lens housing-also shield it from sand, dirt, dust and mud. Dust can scar the lens of a non tough camera, grind buttons, knobs and levers to a halt and tear up the delicate insides-and dust will find its way inside. Tough Cameras are as at home in a Kalahari desert sandstorm as they are at the local Tough Mudder. A lenses focal length determines its field of view. The smaller the number, say 25mm, the wider the field of view. The larger the number, say 100mm, the narrower the field of view. The focal length of the Tough Cameras reviewed range from 25mm to 140mm. Wider lenses are better for scenics, selfies and groups. Longer focal lengths are better for portraits, wildlife, flowers and pulling in distant landscape features. Although 140mm isn’t really long by telephoto standards and won’t shrink the distance between you and that faraway shot by very much it’s still better than having only a fixed focal length lens (such as in cell phone cameras) to work with. Paintbrush wildflowers in the Sierra. Photo taken with the Panasonic Lumix. Photo by Whitney LaRuffa. Apertures regulate the amount of light needed for an exposure. The higher number of aperture, f/22 for example, the less light a lens can gather for exposure. Thus, smaller aperture numbers are best for low light situations. As a lens’s focal length increases, when you’re using the zoom function, the size of it’s aperture decreases: f/16 allows less light in for your exposure than f/2. But, and this is a big but, the lower the aperture number the shallower the depth of field. If you want your subject in focus from the wildflower in the foreground to the mountains in the background, you’ll use a smaller aperture to increase the depth of field. A basic understanding of how this works is nice to know and some Tough Cameras do have a manual aperture and shutter speed settings so you can control depth of field and exposure. But the reality is, Tough Cameras and their various settings take care of all the guesswork for you. I shoot 90% of my Tough Camera photographs on the “Scene” setting and “landscape” subsetting with the focal length and aperture at its shortest and widest focal length and aperture. Sierra ptarmigan taken with the Panasonic Lumix. Photo by Whitney LaRuffa. Photographers can get excited about the number of megapixels a camera has. A megapixel is 1 million pixels. A pixel is a small square, like a piece of tile, that when fit together with other pixels creates a photograph. The density of these pixels determines the resolution of your picture. The denser the megapixels, the higher the resolution making your photos sharp and crisp and the colors vibrant. With a higher resolution you can blow the photograph up to hang on the wall or make it a screen saver without the image becoming pixelated-when scant pixels are stretched too far. The Tough Cameras reviewed range from 12MP to 20MP. Here’s the catch. Megapixels alone don’t determine image quality-a camera’s optics and the size of its processing sensor does that. A camera can have fewer megapixels but a larger sensor and a better lens and produce higher resolution images than a 20MP camera with a smaller sensor and optically inferior glass. We’ve listed the type of processing sensor these Tough Cameras have along with their MP’s. Only one of the Tough Cameras we reviewed is able to shoot RAW images. Although most users will stick to the Jpeg format, the ability to capture images in Raw (you can shoot RAW and Jpegs at the same time) allows for major fine-tuning adjustments in post-production editing, especially in highly contrasting or low light situations. Tough Cameras (all but one reviewed here) have Wi-Fi and/or Bluetooth capability so that no matter where you are in the world, images can be transferred easily from the camera to a cell phone or tablet. Some of the cameras we reviewed have GPS and the ability to geo-tag photos based on your location. Some also come equipped with thermometers, barometers, altimeters, electronic compasses, and depth measurements for underwater photos. The cameras we considered shoot in 4K, 1920x1080 full HD, or 1080 video. Only one Tough Camera reviewed had the option of using an electronic viewfinder (EVF, instead of the usual LED back of the camera screen). With an EVF you can compose your photo through a viewfinder like you find on full size cameras. All the Tough Cameras reviewed had LED monitors for viewfinders. Although all monitors were about the same size, even a small difference in monitor size helps when composing or playing back for review. All of these cameras can be had for under $500 and there are numerous deals, sales and discounts to be had that make them even more affordable. Note: Photos in this story were taken on the Olympus TG-5, Nikon CoolPix AW100, Panasonic Lumix DC-TS5, and Ricoh WG-40, some of which are previous models of the cameras discussed in this story. All cameras were purchased by the photographer and not provided by the manufacturer.